SE is giving us pretty limited options for how the site is going to look going forward. Our most popular customization request, judging either from Carlo Beenakker's original suggestion or the discussion here, doesn't look likely to happen at least any time soon, because (according to Catija's comments at the first link above), SE wants those screen elements to be the same across the network. As an example of a SE site that looks pretty good in the new theme, we've been pointed toward Worldbuilding. From what I can figure, the main difference lies in choosing a good background -- for example, look at the graph paper background on MSE. Right now we have this oppressive gray color which looks like a placeholder for something better. So does anybody have suggestions on what kind of background might be good? Just as importantly -- does anybody have strong feelings about backgounds that would be bad? I think a poorly-chosen background could easily make the feel of the site even worse than it is now. It can't be too dark. SE wants the left nav ("Home", "Questions", "Tags", "Users", "Unanswered" on the left part of the screen) to be visible on top of it. MSE already has a graph paper background, so we probably don't want that. 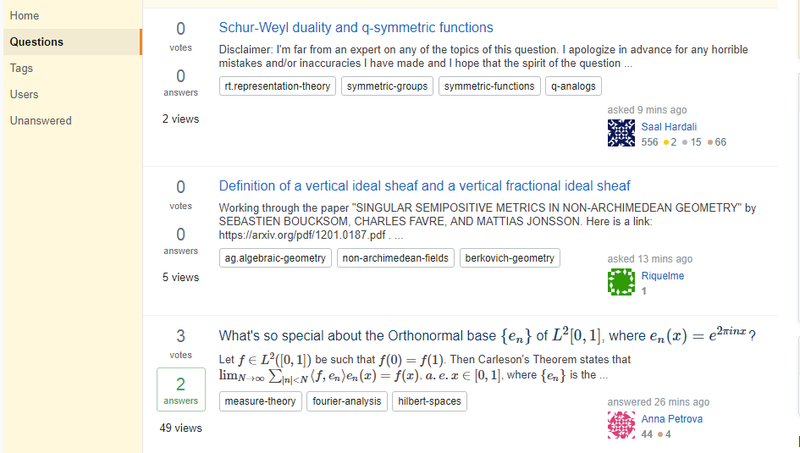 Mathematica stack exchange already has some kind of Penrose tiling in their header. So we probably don't want that either. 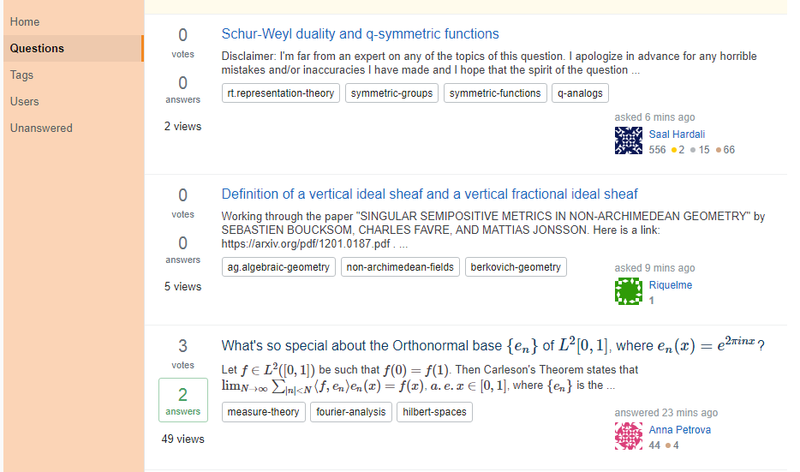 Another thing to notice from Mathematica stack exchange -- a plain white background might not be a terrible thing. We don't have to go crazy. The linked examples are: Travel, RPG, Code Review, Puzzling. Above all it should be noticeable. The MSE grid paper background is nice but done in blueish white on grayish white and nearly invisible even for people with normal color sight (checked 6 months ago) like myself. As a matter of fact, I have never suspected it was there until I read about it in some meta thread. Then I strained my eyes and voila, I noticed thin lines of the big cells. It took me some more effort to notice the small cell lines, but now I see it (mainly because I expect to see it, not because it is there). If we do something like that, I would say we'd better not bother at all. Second, it should be MO-specific in the sense that if you show somebody just the background and ask him whether he thinks it is MO, MSE, Physics, etc., he should not hesitate a second to answer that it is MO. Third, it should be non-obtrusive. It shouldn't attract the eye more than main fields so once you register it, it should be easy to ignore it for the rest of the reading. I guess anything that passes these 3 requirements (plus doesn't violate general common sense and taste too much) would be fine. Unfortunately, I cannot offer a good design myself at the moment, but I guess we have plenty of people here whose artistic abilities are not as dismal as mine :-). The post mentions that "Sidebars/backgrounds can have a light-colored solid." The site Travel Stack Exchange is cited as an example. A possible advantage of having some color in the sidebar (and perhaps also in other places) would be that the site would become more easily distinguishable from other sites that use different (or none) color in the sidebar. I have tried at least what the sidebar would look like with some colors. 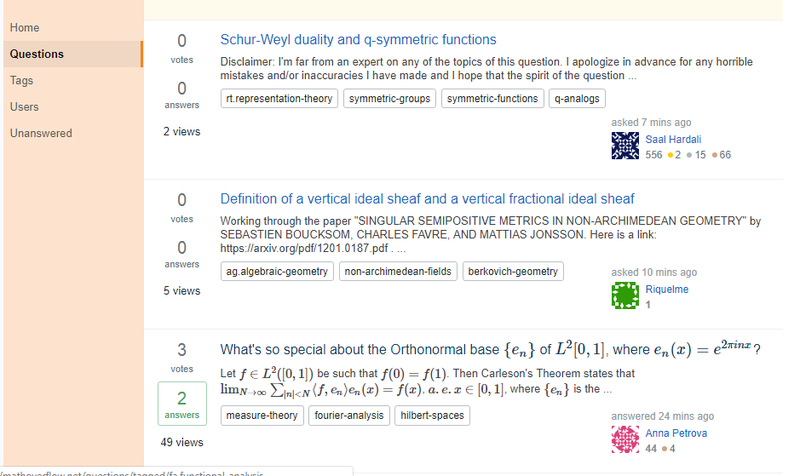 Take this mainly as a post asking users whether something similar would be acceptable - the final choice would be done by Stack Exchange design team, this is just to get some feeling what possibilities look reasonable for the MathOverflow community. So I am mainly asking whether having colored background might be a good option - and I'll leave the exact choice of colors and other implementation details for people more knowledgeable about this (as recommended elsewhere). In any case, the color should probably be not too strong. And also it would probably be good to use colors close to the ones used in MathOverflow logo or elsewhere on the site, so that there is not a stylistic clash. EDIT: I should probably mention that I did include screenshots only showing left navbar and not the header on purpose. Deciding whether or not header should have solid background and choosing the background color or background image for header which goes well together with the colors in the logo and the color in the left navbar can probably considered a separate design choice. What makes Worldbuilding so nice is that there's an image in the bottom left which doesn't disappear when you scroll. I wish the MO logo in the top left would just stay as you scroll, but without that some kind of new vertically oriented logo in the bottom left would be great.